Access to the junk are some of the considerations for proper pricing. The large trailer (pictured) is 12′ feet long x 6′ wide & 4′ feet tall. The size of a 10 yard dumpster! ***For an average full trailer load, the charge is $160 which includes loading, disposal fees, gas and labor . ***Smaller jobs have smaller prices $140, $120, 100, 80, etc…. (Itemized items, like you just need to get rid of a couch or dresser) just call me! ***Heavy full loads can be $180 to $200. (Option A) Many customers sort through the junk, make a pile in their garage or driveway and stage what they don’t want. You call & book the day & time for me to show up. I back the trailer up to the pile & load it up. It’s gone in a short amount of time! (Option B) Drop off service. I leave you a trailer parked chocked up & locked up. Positioned in your driveway early & you take the day to fill it at your leisure. A daily dumpster rental with easy load ramp. 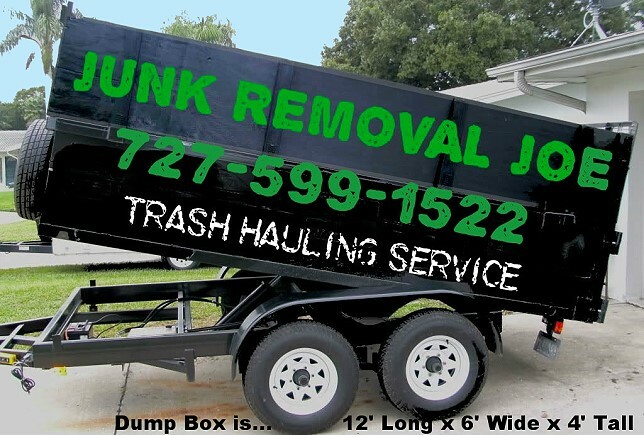 Please see the dumpster rental page on this website for more details! (Option C) You need me to take something out from a room such as furniture, appliances, etc… My many years of experiences is impressive. I use a dolly or hand truck & just remove large items without any damage. Often customers swear it will take a few men. I’ve done every situation many times by myself. Sometimes a customer if able will give a helping hand assisting. My years of experience affords me the knowledge to keep the right tools aboard my truck like winches, straps, blankets, saws, hammers, & things to make situations go easy. My prices beat big name junk removal companies, since I’m a one man operation! Please shop & compare. Labor jobs or drop off trailer prices, I’m usually cheaper!!! If same day service is not available you can schedule a labor load pick up time or drop off time for trailer rental. Please see my dozens of good reviews on Google & all over the internet. BTW….I am usually 5 minutes early or I consider myself late!! !